In July Valdez resigned 48 hours before he was due to stand for re-election following the release of compromising audio recordings. Valdez, who had been in the job for four years and was bidding for a second term, denied the recordings had any link to his resignation. “This decision has been motivated solely by family and personal reasons that have nothing to do with the context of the current election,” he explained in a statement released by the federation. But he now faces the prospect of becoming the latest South American football strongman to be forced out, having been appointed to FIFA Council in January 2016 after withdrawing his candidacy for the CONMEBOL presidency. 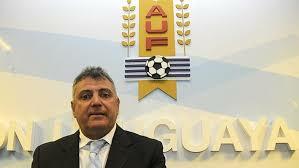 Reports suggest Conmebol are lining up Argentina’s federation chief Claudio Tapia to replace him on Friday.